The People’s Majlis has barred vice president Dr Mohamed Jameel Ahmed’s lawyer from responding to charges on his behalf before an impeachment vote at tomorrow’s parliament sitting. Jameel is currently in London, and had appointed former attorney general Husnu Suood to read out a response on his behalf. However, in a letter addressed to Jameel today, Speaker Abdulla Maseeh said the vice president himself must be present at the sitting, according to the Constitution. A lawyer can only accompany Jameel and provide him with legal counsel at the sitting, the letter said. Article 100 (d) states that the vice president shall have the right to defend himself in the sittings of the People’s Majlis, both orally and in writing, and has the right to legal counsel. 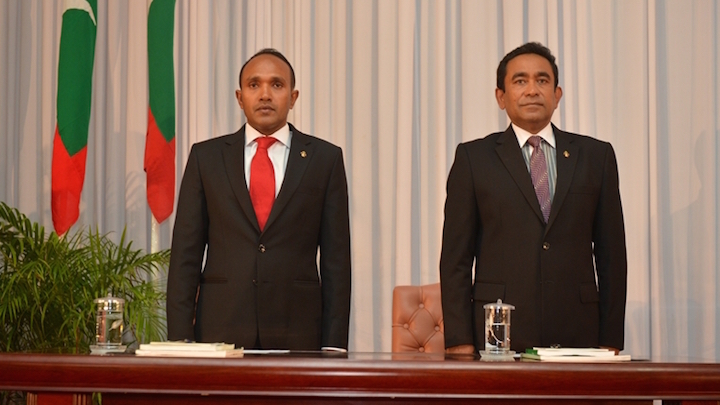 MPs of the ruling Progressive Party of the Maldives (PPM) have accused Jameel of incompetence and disloyalty. The vice president abruptly left the Maldives within a day of parliament approving a constitutional amendment that will allow President Abdulla Yameen to replace him with the tourism minister. A two-thirds majority or 57 votes of the 85-member house is required to remove the vice president. The motion alone gained 61 signatures. Jameel was asked for a response in early July, but did not respond within the 14 day period. PPM MPs have previously said he refused to comply with the president’s orders to return to the Maldives and answer charges. The pro-government majority in the parliament has since amended Majlis standing orders so that an investigation is not required before impeaching the vice president. MPs have also set just 30 minutes for the vice president to respond to charges. Suood told Minivan News today that the 30-minute response period was insufficient. He said he had been preparing a defense based on statements made by PPM MPs in the media as the parliament is yet to inform him or Jameel of details of the charges against him. The Majlis secretariat told Minivan News that a copy of the impeachment motion had been provided to Jameel with the letter notifying him of the 14-day notice. The motion, obtained by Minivan News, accused Jameel of incompetence, dereliction of duty, links with the opposition and failure to defend the government. The vice president is also accused of excessive expenditure from the state budget. “No substantial evidence has been made public. I do not believe that president Yameen’s alleged lack of confidence in vice president Jameel is sufficient grounds for impeachment,” Suood said. PPM parliamentary group leader Ahmed Nihan, however, said the president’s confidence in the vice president is crucial as he is to assume the responsibilities of the president in his absence. Nihan said PPM MPs had gathered a large amount of evidence and information regarding Jameel’s alleged incompetence for over a year. “Projects assigned to Jameel in sectors such as education and health had been stalled for about ten months. He also attempted to divide MPs by taking some of them on trips and making statements that may affect their confidence in the president,” he said. “We also have evidence of Jameel’s official and unofficial involvement in the opposition protest on May 1,” he added. Some 20,000 people took to the street on May 1 over former president Mohamed Nasheed’s imprisonment. Some 200 people were arrested in violent clashes. Jameel has denied allegations of incompetency. In an interview with the New Indian Express, he said that he had been carrying out his duty as the President Yameen had ordered him to. Opposition politicians have meanwhile claimed President Yameen is fatally ill and wants a more loyal deputy ahead of a life threatening surgery. The government continues to deny rumors of the president’s health. The parliament in late June passed the first amendment to the constitution with overwhelming multi-party consensus to set the new age limits of 30-65 years for the presidency and vice presidency. Tourism Minister Ahmed Adeeb is now 33. The constitution previously stated that candidates must be 35 years of age.